It’s Watermelon season so I figured now is a great time to teach you how to pick the perfect watermelon whether it’s at the store, farmers’ market or in your own backyard. Most people just grab one out of the bin and hope for the best. 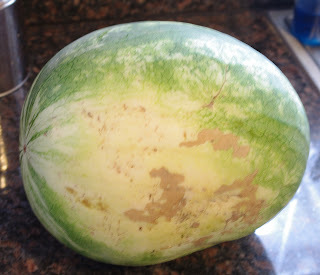 But nothing can be more disappointing than a lackluster watermelon on a hot summer day. I’ve perfected my watermelon picking skills and have rarely ever been disappointed. Picking a watermelon should not be based on smell like with other types of melons. Let’s face it, they just don’t smell all that much. Instead you want to use sight and touch to pick the perfect watermelon. First you want to find a melon that has distinct markings and a yellow spot. This is the most important part. The spot shouldn’t be cream. It doesn’t have to be a dark or bright yellow, but it needs to be distinctly yellow. Next you want to pick up your watermelon. You want it to be a lot heavier than it looks. Those are the most important traits for a sweet, ripe watermelon. You can also give it a slap and if it makes a “thunk” sound it’s good, but this is a minor characteristic of a ripe watermelon and shouldn’t be solely relied upon as unripe melons can also make the “thunk” sound. Thanks for the watermelon tips — one of the greatest mysteries in my life. I hate bringing one home, and then the disappointment. I'll try your technique next time I'm out shopping! This is really good for me because I have no sense of smell. It's nice to know I can still pick a good melon! Where was this post yesterday!! Now I have to play Russian Roulette with the melon I bought yesterday. I have such bad luck picking good ones. Thanks Rach!